Bill Zender has an MBA and more than 30 years experience in the gaming industry. He’s widely recognized within the industry as a leading authority on all aspects of casino management and game protection and is much sought after as a gaming operations consultant and lecturer. 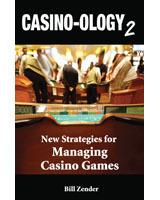 Bill is a former part owner, vice president, and Director of Casino Operations at the Aladdin Hotel-Casino in Las Vegas, and has written a number of books on game protection and advantage play, including the first book on card counting written specifically for the casino industry. In addition to these accomplishments, Bill spent two years as a member of the Nevada Gaming Control Board as an agent with the Division of Enforcement; owner and instructor at PCI Dealing School; Asian games manager at the Desert Inn in Las Vegas; and the interim General Manager at the Casino San Pablo, a card room and casino in California. He also spent some time on the other side of the gaming table as a professional card counter and advantage player. Presently, Zender is the owner and primary consultant for Last Resort Consulting.